Chip Reese’s son has Down Syndrome, and asked his dad why there were no super heroes that were similarly afflicted. Chip’s answer was to create Metaphase. Originally conceived as a trade paperback, Alterna broke it down into two double-sized comics for its newsprint line. The story centers around Ollie and his family. Ollie’s dad is the super human Sentinel. He worries about Ollie and the congenital heart defects that Ollie was born with. Ollie’s only wish is to be more like his dad, and with “Meta-Makers,” a company promising to deliver super-human powers to people, Ollie thinks he can grow into the powered individual he wants to be. The first issue was a good chapter with many elements being introduced for the story. However, this second issue blew me away with the pacing, the art, and most of all, the heart. As a second issue, many elements that were covered from the first issue are conveniently summed up, making the first issue not essential for the story contained here, so if you can’t find issue 1, you won’t be lost. Ollie has already made his first trip to Meta-Makers and discovered a little bit about what he needs to do if he were to start the program. Behind the scenes, is a person looking to defeat Sentinel, and Meta-Makers is his company to farm DNA so he can source the powers to win. 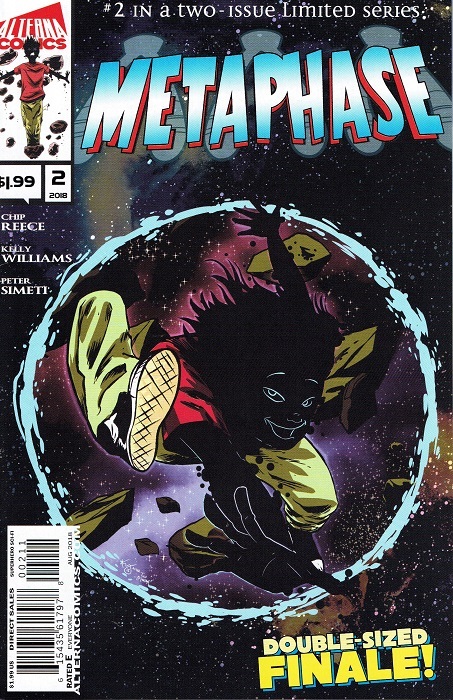 This issue begins innocently enough with Ollie talking to his dad about Meta-Makers, and then mischievously going behind his back and inadvertently gives Genepool the Sentinel’s DNA. This leads to the battle between Genepool and the Sentinel, where Ollie gets involved because he realizes what he’s done. This is Chip’s first work in comics and he has all the basics down. Where as the first issue definitely could be seen as a love letter of sorts to his son, this second continues that sentiment but really ramps up that good ol’ comic book superhero action. This issue does not feel like a double sized issue, it’s a page turner. The meat of the plot has no wasted words or panels and the book logically progresses. I would say that Chip found his groove here as he blended Superman, Invincible, and the love for his son into this issue. Kelly’s art really reminds me of a slightly stylized version of the 90’s Superman titles. Layouts are fantastic as they flow into one another. The characters have crisp, sharper lines, and wonderfully expressive faces. Wonderful use of splash pages and big panels which express the fight with the powered individuals on a grand scale. Overall, I’ll express again how the art even has a vibe of Invincible, but lighter, as it is an all ages book. This book gets 5.5 beers out of a 6 pack! Just a wonderful book that kept me turning the page. I think beyond the great writing and art, Chip’s love for his son just shines through the pages to push it above much what I’ve read this year. I think this is a book just about everyone should read.